Are you wondering if I am a bowling fanatic? Well, I'm not (although I do like to get my bowl on once in a while. I mean come on - who doesn't?) But this little number isn't just for those of you in a league, it's also for those of you who like quilts that are simplistic, quick to put together and that make a bold statement! A few years ago I came across a darling little boys room in a Better Homes and Garden "Kids Rooms" magazine. This particular room was quite the feature with several pages highlighting every detail. The room had rugby stripes painted around the bottom of the walls. It was decorated with lots of galvanized steel, painted furniture in muted reds, golds and blues and some vintage game pieces. Did anyone see that room? Well, I loved it! I loved the vintage-retro feel it had. I loved that it kind of had a theme - without having a theme (if you know what I mean?) I loved the stripes and I especially loved the vintage bowling pins displayed on the shelves. That room inspired what is now my 9-year-old son's current bedroom. You can see a couple of pictures of his room HERE. Ever since I saw the room in that magazine, I have been wanting to take the idea a step further and use it for a quilt design. So finally, a few years later, here it is! 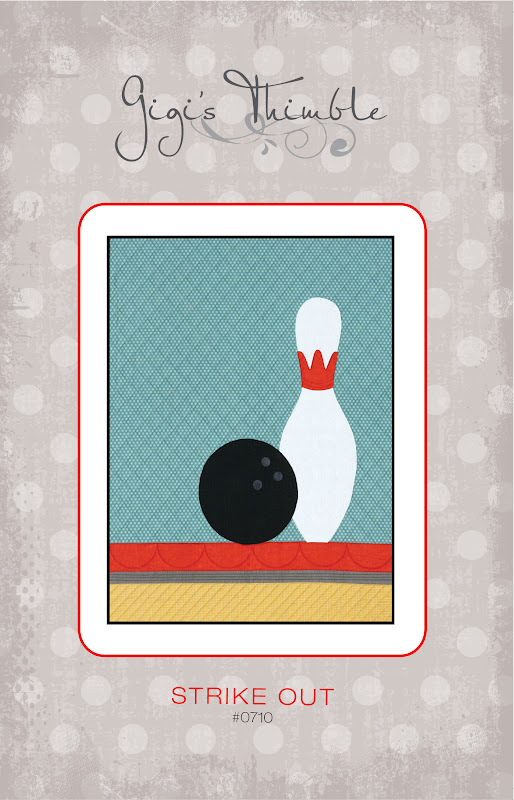 Strike Out is so simple and graphic so I wanted to do some really modern, graphic designs for the quilting, as well. I had one of my favorite quilters (Kaylene Parry in Lehi, UT.) do large cross-hatching on the background, swirls on the bowling pin and ball, and scallops and stripes on the stripes. I think the quilting turned out great! Kaylene did a fantastic job! I couldn't resist this Circa 1934 number fabric by Cosmo Cricket for Moda for the backing - kinda goes with the bowling theme, I think. For the binding, I chose this black and grey houndstooth fabric that really pulls in the black and grey of the bowling ball. Strike Out finishes at 38" x 47". The perfect size for a crib, nursury or just a throw for your favorite little one. Please leave your contact info and make sure you're a follower. This giveaway will close Sunday night at midnight. I think it's darling, Amber. Perfect for a little guy. I love the retro/graphic vibe you have going on here! I love it - you did good! Great pic. It's so fun!!! I ADORE quilts that tell a story, and this one is perfect! I'd love to win a copy- thanks so much for the chance! What a cutie!. Oh, and the quilt is cute too. :) :). Seriously, it really makes a statement. All my young ones are all grown up and none of them are bowlers, but I can totally see it for a young man or lady who is just getting the feel of bowling leagues etc. That's adorable. My 2 1/2 year old great granddaughter has discovered bowling, I think that girls would like it too. Love it!! Very cute design Amber. How cute!!!! Looks like your Son thinks its a WINNER as well! This quilt is so much fun. It really did put a smile on my face. I haven't bowled in years, but you don't have to be a bowler to love it. Your friend did a fabulous job on the quilting. I love the quilting on the pin and the ball, it really makes them stand out from the rest of the quilt. I absolutely love this and my 11 year old grandson would just love it and by hook or by crook I shall make this for him and really hope I win this pattern. Little boys? I would make this for my dad, or my 50 plus year old brother who are both avid bowlers. My brother has bowled not one, but two 300 hundreds games. His wife and kids are bowlers as well, they would love this! Very Very Cute. I think that it is neat how you used the number fabric for the back of the quilt :) It would be a fun quilt for quite a few different people, I could see that for sure. It's a wonderful quilt! It's perfect for a kid's quilt, in a playroom, or where ever it just shouts FUN! Awesome, Awesome, Awesome! I love everything about this quilt. So much fun!! How cute is that? Love it! Thanks for the opportunity to win. I love it. I love to play bowling with my pensioner friends. Adorable! How could anyone not love a giant bowling ball and pin? It's perfect! Amber, I think it's wonderful! I love the simplicity of it yet how it just pops with those colours! Love, love, love it! A very cute pattern. I think you've done well with your design. I also love the quilting on your finished quilt. My boys would love this quilt as they think bowling is fun! :) And I love the fabric you used! Thanks for a chance to win! :) I'm a follower! This is so perfect for a little young man. I love it. Oh thats so cool! My husband's league just finished a few weeks ago, he'd love me to make him something like that. I'd LOVE this pattern! I'm a 15 year Tuesday morning league bowler~ my two partners would LOVE this little quilt! It's the cutest thing ever! Just perfect for my girls! Great design! Great work! Love it. It is adorable. My boy would love it. I know a big boy (adult) who bowls and would love this. What a novel and yet simple design. I think your bowling quilt is very cute and there are lots of boys and girls who would love to have that quilt. Made me think of my mama! !She was such a hoot! Loved to bowl and bowl in leagues up until she was in her sixties. She may no longer be with us here but up in heaven she is admiring, just like me, this perfect "strike" quilt. I just stumbled across your blog as I was doing a Google search for "bowling bedding." Yup, that's right, I actually googled"bowling bedding." You see,my four year old son is OBSESSED with bowling (and has been since he was two). He is on an actual bowling league, and regularly scores higher then the big kids (or myself!) He would like nothing more than to bowl all day every day, and actually spends some if his free time watching YouTube videos of old bowling competitions. The funny thing is, no one else in our family bowls, he came to it totally on his own! I would love the chance to win this quilt in twin size, or even learn to make it myself (although I lack sewing skills).